Coffee is the second most consummated beverage in the world after water. In Germany, with 146 litres per person and year, coffee is even more consummated than water and beer. With its flavours, it revitalises body and soul. Close to the monastery of Chehodet, situated in Yemen, a few shepherds let their goats browse. One day the goats jumped around wildly, happily made baaing noises and even were not quite at night. The shepherds that could not sleep tried to find the origin of the strange behaviour of their animals. Obviously the reason was the small red berries which grew on the bushes in the mountains. Die monks of the monastery  curious because of the tellings of the shepherds  made an infusion out of the berries. In fact, they were also put in this jolly, sleepless condition, which was very welcome to them. The new drink kept them awake during their nightly prayers, which were enjoined on them by the rules of the order. However, the Ethiopian Highlands and the mountain forest of the old kingdom of Kaffa (Abyssinia) respectively are said to be the origin of the coffee bush. From there, the bean found its way to Yemen. Avicenna (Abu Ali al-Husayn ibn Abdullah ibn Sina 980-1037) was a Persian doctor, physician, philosopher, lawyer, mathematician, astronomer and alchemist. He delivered the first written reference that is known, when he wrote about a remedy called bunchum of which its origin was Yemen. Even 500 years later the cultivation and the coffee bean respectively was called bunc in this region. It can be concluded that Avicenna, in his description of the remedy, described the use and importance of the coffee bean explicitly for the first time. According to a narration of 1453, the mufti of Aden, Gemaleddin, arranged for coffee to be imported from Abyssinia to be able to cultivate the first coffee in Yemen. From the port of Mocha, the coffee bean came, via the Red Sea, to the Arab Empire. By an uncountable number of pilgrims, who visited the Muslim sanctuaries Mecca and Medina, the drink was spreading rapidly. 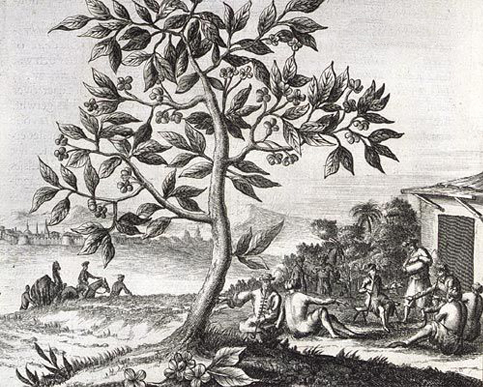 In 1510 the aromatic cherry reached the African continent again and landed in Cairo. The governor of the Egyptian Sultan, Khair-Beg, gave order to close the coffee bars in Mecca in 1511 (Mecca had been a part of Egypt since the 13th century). The reason for this was the mockery of the population about his proposed renewals. He did not only dislike coffee because he was free of any stimulant, but he especially disliked the coffee drinkers who  according to his investigations  jeered his politics and thus undermined his authority. This is because he agreed, together with scholars of the Koran, on the fact that the drink had a bad influence on health and declared it unwanted, which could be compared to its banning. However they forgot to bear in mind the Sultan of Egypt who was a passionate coffee drinker and who annihilated the ban immediately. Apart from that, the coffee house had become an enormous source of tax income. If a husband denied his wife coffee this would be a cogent reason for divorce. The commercial centre between the Austro-Hungarian Empire and the Orient, were the important North Italian ports of Venice and Trieste. There the coffee bean was known by trades people and travellers. At this time, there had not really been any trade, as the Arabians made the cultivation of coffee a state secret and any kind of exportation of germinabel beans was forbidden. It is therefore unknown how it found its way into foreign countries. In the year 1640 the first coffee house was opened in the Christian part of Europe: of course in Northern Italy (at the Marcus Place in Venice). In the following 100 years this new beverage had set out to conquer the whole of Middle Europe and even today it is unbroken. As a result only some time later the first coffee houses opened in the whole of Europe: 1650 Oxford, 1652 London, 1659 Marseille, 1663 Amsterdam and Den Haag and 1672 Paris. In 1673 Bremen was the first location of a coffee house on German soil before Hamburg opened the doors of its first coffee house four years later in 1677. However, coffee had to overcome some barriers on its way into the world. Both in Europe and in Arabia it became object of moral accusations and was oppressed and partially even banned by certain political, religious and economic circles. Thus Christian fanatics requested Pope Clemens VIII to proscribe the heathen devils drink. The Pope, however, did not allow to be misled and wanted to try the coffee himself. He liked it that much that he became a great adherer of it. For a long time nonetheless, this exotic beverage was only reserved for the elite. For the common people this new and exclusive drink was just too expensive. Nevertheless, through colonization coffee was distributed and cultivated in many countries in the world and as a result it became affordable for everyone.